The debate about the future of publishing has never been more heated. From e-books to self-publishing, the landscape is shifting fast and many are wondering if traditional players will be able to keep up. We’ve already seen one element of that chain suffer: brick and mortar bookshops such as Borders who have had to fold because of the competition of online retailers. Amazon sells paper books of course, but also has a hold on the incredibly fast growing e-books market and even mighty Apple’s iBooks hasn’t been able to seriously challenge its grip. As far as I understand, the Kindle is outselling the iPad as an e-reader and all you have to do is visit both companies’ stores to realize how limited iBooks’ catalogue is in comparison with Kindle. To some, this spells the end of publishing houses as we know them. To me, these changes mean that publishers and agents, who were traditionally the gatekeepers of the industry are seeing their influence dwindle, and that other players, especially authors, now have better control over their own destiny: if you have a good piece of work, and you know how to promote it, you can pretty much go it on your own and succeed. With minimum investment, you can get your book on the internet and the sky is the limit in terms of the promotion you can do both online and offline. In the Middle East, this is all the more important because the publishing industry is less mature, copyright is not respected and being an author is unrewarding. Globally we haven’t yet seen high profile success stories for self-published books: the blockbusters of the past few years have been the likes of Twilight, the Hunger Games or 50 Shades of Grey who were published the “traditional” way, but there are numerous self-published writers who have managed to sell thousands of books on their own, better than most publishing houses' mid-list authors. I’m lucky to have a good publisher (Turning Point Books) and I’m happy with my relationship with them, but I support fellow writers who decided to circumvent the submission/rejection cycle and do it on their own. 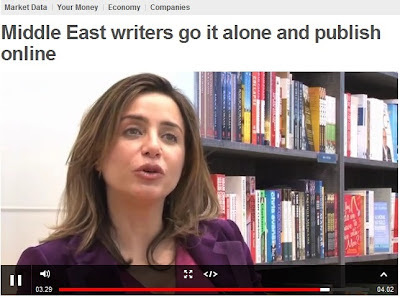 Check out this clip of me discussing this with the BBC’s Ben Thompson, along with media man extraordinaire and self-published author Alexander McNabb as well as distributor Narain Jashanmal other members of the publishing industry in the Middle East.